Richard studied ​engineering at Manchester University. ریچارد در دانشگاه منچسترتحصیل کرده است. He studied French at university. We must study the map before we leave. He's doing a course in Business Studies. Recent studies show that women still get paid a lot less than men. Set aside a period of time specifically for study. I gave up my studies when I had the baby. His face was a study in fear. ▪ do a study/carry out a study (also conduct a study formal) The scientists are carrying out a study into the effects of global warming. ▪ a study finds something The study found that men were more likely to take risks. ▪ a study shows something Studies have shown that the drug works. ▪ a study suggests/indicates something A British study suggests that older drivers are safer drivers. ▪ a study reveals something (=shows something, especially something surprising) A recent study revealed that 74% of donuts are bought on impulse. ▪ a study confirms something (=shows that something is true) The study confirms what we all know – smoking is also bad for the people around you. ▪ a study aims to do something The study aimed to identify the housing needs of local people. ▪ publish a study The study was published in the British Medical Journal. ▪ fund a study (=pay for it) The study was funded by a major US drugs company. ▪ commission a study (=ask someone to carry out a study) The government has commissioned a study into the health of residents living near the power station. ▪ a research study Research studies have found that young people are drinking no more than they were 20 years ago. ▪ a detailed study (also an in-depth study) They carried out a detailed study into the effects of the disease on mice. ▪ a two-year/three-month etc study They are engaged in a five-year study into the effects of calcium on bone health. ▪ a huge/massive study The journal published the results of a massive study of 87,000 women. ▪ a previous/earlier study The report is a summary of the work done in earlier studies. ▪ a pilot study (=one done to find out if something will be successful) The government has just completed a pilot study, with some encouraging results. ▪ a feasibility study (=one done to find out if something is possible or practical) They commissioned a feasibility study into re-opening the whole railway line. ▪ the aims of a study The aims of this study are to examine the reliability of current techniques. ▪ the results/findings of a study The results of this study suggest that the drug is effective in over 80% of cases. | His research confirmed the findings of earlier studies. ▪ research noun [uncountable] careful detailed work that is done in order to find out more about a subject, especially as a part of a scientific or academic project: Billions of dollars have been spent on research into the causes and treatment of cancer. | The University has for a long time been a leading centre for research in this field. ▪ work noun [uncountable] the studies that have been done on a particular subject: Faraday is famous for his work on electricity. | A lot of work has been done on hydrogen-powered cars. | Their work had an enormous influence on the study of genetics. ▪ study noun [countable] a piece of work in which someone examines a particular subject in order to find out more about it, and writes about what they have found: The study showed that 25 percent of adults do not eat breakfast at all, compared with 14 percent in 1961. | Recent studies suggest that our sense of smell is closely linked with the part of the brain that deals with memory. ▪ experiment noun [countable] a scientific test in order to find out what happens when you do something: They carried out a series of experiments (=they did a series of experiments) in order to try to prove their theory. | Experiments have shown that there is an increased risk of some forms of cancer. I’ve been studying English for six years. I can’t study with that music playing all the time. Anna is studying French literature. Stephen is currently studying at Exeter University. My brother’s studying to be an accountant. I’ve only got three weeks left to study for my exams. Goodall was studying the behavior of chimpanzees in the wild. The scientists were studying the action of a protein called ubiquitin. They’re studying how stress affects body chemistry. They got out of the car and studied the map. I haven’t had time to study the proposals yet. ▪ study verb [intransitive and transitive] to learn about a subject at school, university etc: If you study hard, you’ll get a good job. | He studied law at Harvard University. ▪ take verb [transitive] to study a subject that you have chosen at school, college etc: What classes are you taking next semester? | In my final year, I decided to take English and economics. ▪ do verb [transitive] British English informal to study a particular subject at school or university: I can’t decide whether to do German or Spanish next year. | Did you do computing at school? ▪ major in something phrasal verb American English to study something as your main subject at a college or university: Diane majored in psychology at the University of Washington. ▪ revise verb [intransitive] British English to study to prepare for an examination: It’s best to start revising early. | He’s revising for his final exams. ▪ cram verb [intransitive] informal to study very hard and try to learn a lot of information just before an examination: Everyone’s cramming for their final exams. ▪ do research to study something in a very detailed way, especially in order to discover new information about it: He does research at Oxford University. | I’m doing research into second language learning. | It’s difficult to do research on humans. 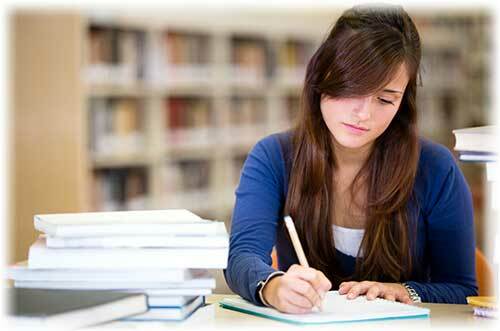 • It is important to develop good study skills. • Physiology is the study of how living things work. • These proposals deserve careful study. • His face was a study in concentration. see in a brown study at brown adj. Middle English: shortening of Old French estudie (noun), estudier (verb), both based on Latin studium ‘zeal, painstaking application’. • A new study shows that fewer students are studying science. • A preliminary study suggested that the product would be popular. • A study group meets every Sunday at the church. • An independent study was commissioned by the department. • He has made a special study of the way that birds communicate with one another. • He lectures in management studies. • In a recent study, 40% of schools were found to be understaffed. • Many undertake further studies after college. • Many undertake further studies after passing their A levels. • Now that her children are all at school, she's going to take up full-time study again. • Research studies carried out in Italy confirmed the theory. • Shakespeare is the subject of a new study by Anthony Bryan. • She devoted herself to a serious study of the Koran. • She returned to her studies when her children reached school age. • She's doing women's studies at Liverpool University. • Students do a foundation year before specializing in their chosen field of study. • The company allows its staff to take paid study leave. • The company undertook an extensive feasibility study before adopting the new system. • The course integrates academic study and practical training. • The first part of the course is designed to develop students' study skills. • The present study reveals an unacceptable level of air pollution in the city centre. • The study aims to examine bias in television news coverage. • The study compares the incidence of bone cancer in men and women. • The study group was selected from a broad cross section of the population. • The study highlighted three problem areas. • The study provided valuable insight into the development of the disease. • The ten-year study covered 13 000 people aged 15-25. • This grammar book is suitable both for classroom use and for independent study. • This phenomenon has been observed in both laboratory and field studies. • This phenomenon has been observed in field studies. • When he has completed his studies, he'll travel around the world. • A comparative study was carried out into the environmental costs of different energy sources. • A detailed study of the area was carried out. • He needed more leisure to pursue his studies. • I returned to full-time study once my kids were all at school. • It's important to develop good study skills. • She crossed the hallway and opened the door to her private study. • Students in the same field of study may have very different skill levels. • The scientific study of American dialects began in 1889. • There's a quiet room set aside for private study. • ~ (sth) How long have you been studying English? • Don't disturb Jane, she's studying for her exams. • ~ (sth) at… My brother studied at the Royal College of Art. • ~ to do/be sth Nina is studying to be an architect. • Scientists are studying photographs of the planet for signs of life. • He studied her face thoughtfully. • Fran was studying the menu. • ~ sth We will study the report carefully before making a decision. • ~ how, what, etc… The group will study how the region coped with the loss of thousands of jobs. These words all mean to think about, study or describe sb/sth carefully, especially in order to understand them, form an opinion of them or make a decision about them. examine • to think about, study or describe an idea, subject or piece of work very carefully: ▪ These ideas will be examined in more detail in Chapter 10.
analyse/analyze • to examine the nature or structure of sth, especially by separating it into its parts, in order to understand or explain it: ▪ The job involves gathering and analysing data. ◊ ▪ He tried to analyse his feelings. review • to examine sth again, especially so that you can decide if it is necessary to make changes: ▪ The government will review the situation later in the year. study • to examine sb/sth in order to understand them or it: ▪ We will study the report carefully before making a decision. You examine sth in order to understand it or to help other people understand it, for example by describing it in a book; you study sth in order to understand it yourself. discuss • to write or talk about sth in detail, showing the different ideas and opinions about it: ▪ This topic will be discussed at greater length in the next chapter. • He studied her thoughtfully, then smiled. • He studied under Professor Sager. • In the third year a number of areas are studied in detail. • She is studying hard for her A levels. • She picked up the letter and studied it carefully. • The influence of heredity is best studied in genetically identical twins. • This area has not been well studied. • As a young composer he studied under Nadia Boulanger. • Did you ever study any sciences? • He sat up very late that night, studying. • I had a place to study engineering at Leeds. • I have two tests tomorrow, and I've barely had time to study. • I was up late studying for my biology final. • Michael studied at Sussex University. • She's studying hard at the moment. • She's studying to be an architect. • There's nowhere for the students to study quietly. I want time to study this contract thoroughly before signing it. [+ question word] Researchers have been studying how people under stress make decisions. Some studies have suggested a link between certain types of artificial sweetener and cancer. After a pause, he gave a studied answer. She listened to his remarks with studied indifference. The report was obviously prepared with studious (= very great) care and attention. They studiously avoided/ignored each other. Next term we shall study plants and how they grow. She's been studying for her doctorate for three years already. Adam doesn't spend enough time on his studies. She was a studious child, happiest when reading. If you study, you spend time learning about a particular subject or subjects. The rehearsals make it difficult for her to study for law school exams. Study is the activity of studying. She gave up her studies to have Alexander. A study of a subject is a piece of research on it. Recent studies suggest that as many as 5 in 1000 new mothers are likely to have this problem. You can refer to educational subjects or courses that contain several elements as studies of a particular kind. She is currently doing a business studies course at Leeds. If you study something, you look at it or watch it very carefully, in order to find something out. Debbie studied her friend’s face for a moment. If you study something, you consider it or observe it carefully in order to be able to understand it fully. A study by an artist is a drawing which is done in preparation for a larger picture. A study is a room in a house which is used for reading, writing, and studying. • Did you study for the test? • She's studying to be a teacher. • He is studying music. • I studied the request carefully. • She was studying his face for a reaction. • The proposal was studied in great detail. • The effects of the drug have never been thoroughly studied.